A truly spacious and beautifully maintained TWO BEDROOM, end of terrace residence with views to the front over an open green. 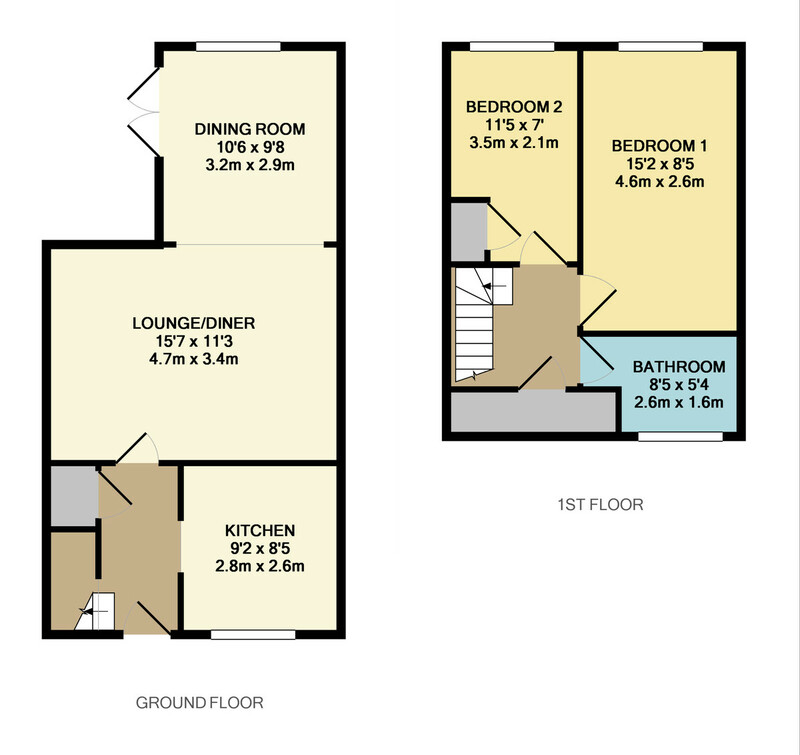 Extended by the present owners to give additional and versatile ground floor accommodation. A real feature of the property are the generous and surprisingly private side and rear gardens. THE PROPERTY A truly spacious and beautifully maintained end of terrace residence with views to the front over an open green. Extended by the present owners to give additional and versatile ground floor accommodation the house boasts both gas fired central heating and double glazing. 2 First floor bedrooms and a modern bathroom suite, Reception Hall, Kitchen and Living room leading to a Dining room on the ground floor. A real feature of the property are the generous and surprisingly private side and rear gardens. Worthy of a detailed internal inspection. RECEPTION HALL White Upvc and double glazed front door. Under stairs cupboard , fuse box, stairs to first floor, Radiator. FIRST FLOOR LANDING Airing cupboard housing the gas fired boiler supplying domestic hot water and central heating. Timber shelving. Carbon Monoxide detector. BDEROOM ONE Dual ceiling fan/light, Double glazed window, window blind, Radiator. BATHROOM White suite comprising: Pine panelled bath, Hot and Cold mixer tap with shower attachment. Pedestal hand basin Hot and Cold taps, Low level W.C. Laminate wood effect flooring, Ceramic tiled wall areas, shower curtain rail, medicine cabinet, toilet roll holder. double glazed window. Radiator. OUTSIDE Front garden enclosed by low brick wall. Gate and path to front door. Various Shrubs. Enclosed side garden, gate to Good sized Rear garden, laid mainly to lawn but with shrubs and flowering plants. Timber shed.